Sterol regulatory element-binding transcription factor 1 (SREBF1) also known as sterol regulatory element-binding protein 1 (SREBP-1) is a protein that in humans is encoded by the SREBF1 gene. This gene is located within the Smith-Magenis syndrome region on chromosome 17. Two transcript variants encoding different isoforms have been found for this gene. The isoforms are SREBP-1a and -1c (ADD-1). The proteins encoded by this gene are transcription factors that bind to a sequence in the promoter of different genes, called sterol regulatory element-1 (SRE1). This element is a decamer flanking the LDL receptor gene and other genes involved in, for instance, sterol biosynthesis. The protein is synthesized as a precursor that is attached to the nuclear membrane and endoplasmic reticulum. Following cleavage, the mature protein translocates to the nucleus and activates transcription by binding to the SRE1. Sterols inhibit the cleavage of the precursor, and the mature nuclear form is rapidly catabolized, thereby reducing transcription. 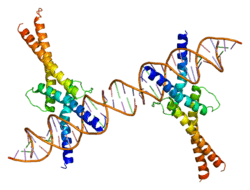 The protein is a member of the basic helix-loop-helix-leucine zipper (bHLH-Zip) transcription factor family. SREBP-1c regulates genes required for glucose metabolism and fatty acid and lipid production and its expression is regulated by insulin. SREBP-1a regulates genes related to lipid and cholesterol production and its activity is regulated by sterol levels in the cell. ↑ Yokoyama C, Wang X, Briggs MR, Admon A, Wu J, Hua X, Goldstein JL, Brown MS (Oct 1993). "SREBP-1, a basic-helix-loop-helix-leucine zipper protein that controls transcription of the low density lipoprotein receptor gene". Cell. 75 (1): 187–97. doi:10.1016/S0092-8674(05)80095-9. PMID 8402897. ↑ Hua X, Wu J, Goldstein JL, Brown MS, Hobbs HH (Feb 1995). "Structure of the human gene encoding sterol regulatory element binding protein-1 (SREBF1) and localization of SREBF1 and SREBF2 to chromosomes 17p11.2 and 22q13". Genomics. 25 (3): 667–73. doi:10.1016/0888-7543(95)80009-B. PMID 7759101. ↑ "Entrez Gene: SREBF1 sterol regulatory element binding transcription factor 1". ↑ Ferré P, Foufelle F (Oct 2010). "Hepatic steatosis: a role for de novo lipogenesis and the transcription factor SREBP-1c". Diabetes, Obesity & Metabolism. 12 Suppl 2 (Suppl 2): 83–92. doi:10.1111/j.1463-1326.2010.01275.x. PMID 21029304. ↑ Eberlé D, Hegarty B, Bossard P, Ferré P, Foufelle F (Nov 2004). "SREBP transcription factors: master regulators of lipid homeostasis". Biochimie. 86 (11): 839–48. doi:10.1016/j.biochi.2004.09.018. PMID 15589694. ↑ Oliner JD, Andresen JM, Hansen SK, Zhou S, Tjian R (Nov 1996). "SREBP transcriptional activity is mediated through an interaction with the CREB-binding protein". Genes & Development. 10 (22): 2903–11. doi:10.1101/gad.10.22.2903. PMID 8918891. ↑ Lloyd DJ, Trembath RC, Shackleton S (Apr 2002). "A novel interaction between lamin A and SREBP1: implications for partial lipodystrophy and other laminopathies". Human Molecular Genetics. 11 (7): 769–77. doi:10.1093/hmg/11.7.769. PMID 11929849. ↑ Lee YS, Lee HH, Park J, Yoo EJ, Glackin CA, Choi YI, Jeon SH, Seong RH, Park SD, Kim JB (Dec 2003). "Twist2, a novel ADD1/SREBP1c interacting protein, represses the transcriptional activity of ADD1/SREBP1c". Nucleic Acids Research. 31 (24): 7165–74. doi:10.1093/nar/gkg934. PMC 291873 . PMID 14654692. Osborne TF (Aug 2001). "CREating a SCAP-less liver keeps SREBPs pinned in the ER membrane and prevents increased lipid synthesis in response to low cholesterol and high insulin". Genes & Development. 15 (15): 1873–8. doi:10.1101/gad.916601. PMID 11485982. Kotzka J, Müller-Wieland D (Apr 2004). "Sterol regulatory element-binding protein (SREBP)-1: gene regulatory target for insulin resistance?". Expert Opinion on Therapeutic Targets. 8 (2): 141–9. doi:10.1517/14728222.8.2.141. PMID 15102555. Szolkiewicz M, Chmielewski M, Nogalska A, Stelmanska E, Swierczynski J, Rutkowski B (Jan 2007). "The potential role of sterol regulatory element binding protein transcription factors in renal injury". Journal of Renal Nutrition. 17 (1): 62–5. doi:10.1053/j.jrn.2006.10.009. PMID 17198935. Ferré P, Foufelle F (2007). "SREBP-1c transcription factor and lipid homeostasis: clinical perspective". Hormone Research. 68 (2): 72–82. doi:10.1159/000100426. PMID 17344645. Hua X, Yokoyama C, Wu J, Briggs MR, Brown MS, Goldstein JL, Wang X (Dec 1993). "SREBP-2, a second basic-helix-loop-helix-leucine zipper protein that stimulates transcription by binding to a sterol regulatory element". Proceedings of the National Academy of Sciences of the United States of America. 90 (24): 11603–7. doi:10.1073/pnas.90.24.11603. PMC 48032 . PMID 7903453. Sato R, Yang J, Wang X, Evans MJ, Ho YK, Goldstein JL, Brown MS (Jun 1994). "Assignment of the membrane attachment, DNA binding, and transcriptional activation domains of sterol regulatory element-binding protein-1 (SREBP-1)". The Journal of Biological Chemistry. 269 (25): 17267–73. PMID 8006035. Wang X, Briggs MR, Hua X, Yokoyama C, Goldstein JL, Brown MS (Jul 1993). "Nuclear protein that binds sterol regulatory element of low density lipoprotein receptor promoter. II. Purification and characterization". The Journal of Biological Chemistry. 268 (19): 14497–504. PMID 8314806. Hua X, Sakai J, Brown MS, Goldstein JL (Apr 1996). "Regulated cleavage of sterol regulatory element binding proteins requires sequences on both sides of the endoplasmic reticulum membrane". The Journal of Biological Chemistry. 271 (17): 10379–84. doi:10.1074/jbc.271.17.10379. PMID 8626610. Shimomura I, Shimano H, Horton JD, Goldstein JL, Brown MS (Mar 1997). "Differential expression of exons 1a and 1c in mRNAs for sterol regulatory element binding protein-1 in human and mouse organs and cultured cells". The Journal of Clinical Investigation. 99 (5): 838–45. doi:10.1172/JCI119247. PMC 507890 . PMID 9062340. Miserez AR, Cao G, Probst LC, Hobbs HH (Feb 1997). "Structure of the human gene encoding sterol regulatory element binding protein 2 (SREBF2)". Genomics. 40 (1): 31–40. doi:10.1006/geno.1996.4525. PMID 9070916. Párraga A, Bellsolell L, Ferré-D'Amaré AR, Burley SK (May 1998). "Co-crystal structure of sterol regulatory element binding protein 1a at 2.3 A resolution". Structure. 6 (5): 661–72. doi:10.1016/S0969-2126(98)00067-7. PMID 9634703. Ericsson J, Edwards PA (Jul 1998). "CBP is required for sterol-regulated and sterol regulatory element-binding protein-regulated transcription". The Journal of Biological Chemistry. 273 (28): 17865–70. doi:10.1074/jbc.273.28.17865. PMID 9651391. Bennett MK, Ngo TT, Athanikar JN, Rosenfeld JM, Osborne TF (May 1999). "Co-stimulation of promoter for low density lipoprotein receptor gene by sterol regulatory element-binding protein and Sp1 is specifically disrupted by the yin yang 1 protein". The Journal of Biological Chemistry. 274 (19): 13025–32. doi:10.1074/jbc.274.19.13025. PMID 10224053. Moldes M, Boizard M, Liepvre XL, Fève B, Dugail I, Pairault J (Dec 1999). "Functional antagonism between inhibitor of DNA binding (Id) and adipocyte determination and differentiation factor 1/sterol regulatory element-binding protein-1c (ADD1/SREBP-1c) trans-factors for the regulation of fatty acid synthase promoter in adipocytes". The Biochemical Journal. 344 Pt 3 (3): 873–80. doi:10.1042/0264-6021:3440873. PMC 1220711 . PMID 10585876. Roth G, Kotzka J, Kremer L, Lehr S, Lohaus C, Meyer HE, Krone W, Müller-Wieland D (Oct 2000). "MAP kinases Erk1/2 phosphorylate sterol regulatory element-binding protein (SREBP)-1a at serine 117 in vitro". The Journal of Biological Chemistry. 275 (43): 33302–7. doi:10.1074/jbc.M005425200. PMID 10915800. Shimomura I, Matsuda M, Hammer RE, Bashmakov Y, Brown MS, Goldstein JL (Jul 2000). "Decreased IRS-2 and increased SREBP-1c lead to mixed insulin resistance and sensitivity in livers of lipodystrophic and ob/ob mice". Molecular Cell. 6 (1): 77–86. doi:10.1016/S1097-2765(00)00009-5. PMID 10949029.